Keld Head Farm Cottages01751 473974work Self-cateringPicturesque group of stone cottages set in open countryside on edge of the market town of Pickering. The cottages have beamed ceilings, traditional stone fireplaces, and pantile roofs. They are spacious, superbly equipped, tastefully furnished with the emphasis on comfort. Some have four-poster beds. Large attractive gardens with garden house, play and barbecue area. 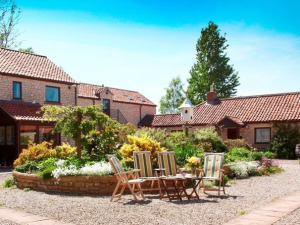 Nestling between Yorkshire's scenic heritage coast of Filey, Scarborough, Whitby and the historic City of York. Pickering has good local pubs serving real ale and tasty regional dishes. It boasts a superb indoor swimming pool along with its famous medieval castle and North York Moors Steam Railway. The North Yorkshire Moors National Park (Heartbeat and Harry Potter country) is on your doorstep; Whitby, Scarborough and York 40 minutes drive away. 4 BEDROOM single storey cottage with private garden, garden furniture and BBQ: Ground floor - Spacious sitting room with open beamed ceiling and stone fireplace with living flame gas fire and dining area/ kitchen with dishwasher & washing machine, one bedroom with a king size bed & on-suite w.c / shower; one bedroom with a king size bed; two bedrooms with twin beds. Bathroom with bath, shower, w.c. and hand basin. 3 BEDROOM single storey cottage: Ground floor - Spacious sitting room with open beamed ceiling and stone fireplace with living flame gas fire; Dining kitchen with dishwasher; one bedroom with a king size bed; one bedroom with a double and single bed; one bunk bedroom. Bathroom with bath, shower, w.c. and hand basin; cloakroom with w.c and hand basin. 2 BEDROOM single storey cottage: Ground floor - Entrance hall; spacious sitting room with open beamed ceiling and stone fireplace with living flame gas fire. Dining kitchen with dishwasher, one double bedroom with four-poster bed, one bedroom with a double and single bed. Bathroom with w.c., hand basin and bath with shower. 2 BEDROOM single storey cottage: Ground floor - Entrance hall; spacious sitting room with open beamed ceiling and stone fireplace with living flame gas fire; Dining kitchen with dishwasher; one double bedroom with four poster bed; one bedroom with one single and one double bed; bathroom with w.c., hand basin and bath with shower. 2 BEDROOM single storey cottage with private garden, garden furniture & BBQ: Ground floor - Spacious sitting room with open beamed ceiling, stone fireplace with living flame gas fire; Dining kitchen with dishwasher; one double bedroom with four poster bed; one bedroom with one single & one double bed; bathroom with w.c. hand basin and bath with shower. 2 BEDROOM two storey upside down cottage to take advantage of the open countryside views: Ground floor - One double bedroom; one twin bedroom; bathroom with bath shower, w.c. and hand-basin. First floor - Spacious sitting / dining room with open beamed ceiling and stone fireplace with living flame gas fire; kitchen. Internal staircase and external stone steps to first floor. 2 BEDROOM two storey cottage: Ground floor - Spacious sitting room with open beamed ceiling, picture window and stone fireplace with living flame gas fire; kitchen / dining room. First floor - One double bedroom; one twin bedroom; bathroom with w.c., hand basin and bath with shower. 2 BEDROOM two storey cottage: Ground floor - Spacious sitting /dining room with open beamed ceiling, picture window, window seat and stone fireplace with living flame gas fire; kitchen. First floor - One double bedroom; one twin bedroom; bathroom with w.c., hand basin and bath with shower. 1 BEDROOM single storey cottage with private garden, garden furniture & BBQ: Ground floor - Spacious sitting room with open beamed ceiling, stone fireplace with living flame gas fire, dining area / kitchen with dishwasher, one double bedroom with king size bed or if preferred two single beds; bathroom with w.c. hand basin and bath with shower. Thank you for taking the time to write us this review we are glad you enjoyed your stay with us.